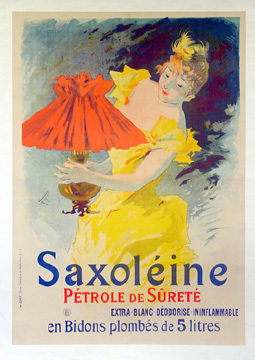 Originally created in 1891, this is one of the first of "Chéret's decade-long campaign for Saxoléine lamp oil...Each of the ten successive annual images contains a woman and a lamp; the only thing that changes is their mutual position...and of course, the color of the dresses and lamp shades also vary. Still it takes talent to be able to make ten images look distinct from each other and make them interesting enough so that some people actually looked forward to see what next year's Saxoléine poster would look like" (Gold p. 19). As always, warm tones persist, with the golden dress and crimson lampshade fairly bursting off the dark blue background.